The next big film is the Shahid-Kareena-Alia star-packed Udta Punjab based on Punjab's drug problem. Bathinda is the only district in Punjab to start a movement 'Rising Bathinda' to find out what is the drug situation on the ground and aims to address it. 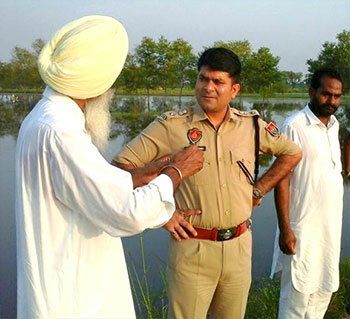 On the third leg of their journey from the foothills of the Himalayas to the Arabian Sea, Rediff.com's Archana Masih and photographer Rajesh Karkera meet Swapan Sharma, senior SP, Bathinda, and visit a drug rehabilitation centre. At 8 am on a Sunday morning, Bathinda in Punjab is stirring to life. Girls on scooters make their way to tuition classes in a city which is said to be the tuition capital of Punjab. Bathinda is part of Malwa, a region dubbed as the cancer capital of Punjab. It has had so many cases of cancer that the 54704 Jodhpur-Bathinda Passenger is called the 'cancer train' for transporting patients to a hospital in Bikaner, Rajasthan, that provides free treatment. The presence of lead in the water caused by harmful pesticides is cited as a reason for the cancer cases and one notices many hospitals, pathology centres and nursing homes in Bathinda and neighbouring Patiala. In the 1980s and early 1990s, the insurgency demanding a separate state of Khalistan had ripped through the state's social fabric. "Night shows were banned. We would bunk class and often watch the 9 am film show," recalls Dr Mayank Jyot Singh, a Rajasthani Jain whose family settled in Bathinda many decades ago. In recent years, the state has been grappling with another threat -- drugs. Udta Punjab, a film that opens later this month, focuses on the drug addiction destroying Punjabi youth. Heroin produced in Afghanistan makes its way through Pakistan into Punjab in well-packed, egg shaped, waterproof 1 kg packets which are smuggled through pipes from across the border. Deterred by the vast desert of Rajasthan and a border heavily guarded by the Indian Army in Jammu and Kashmir, drug smugglers have found ways to breach the border in Punjab. 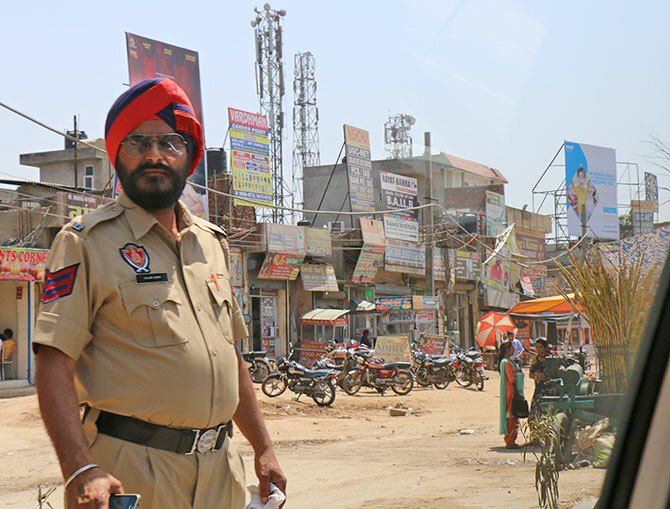 "The Government of India has great fortification at the border -- two levels of barbed wire/electrified fencing and sophisticated weapons -- but there are black sheep," says Swapan Sharma, the senior superintendent of police, Bhatinda. 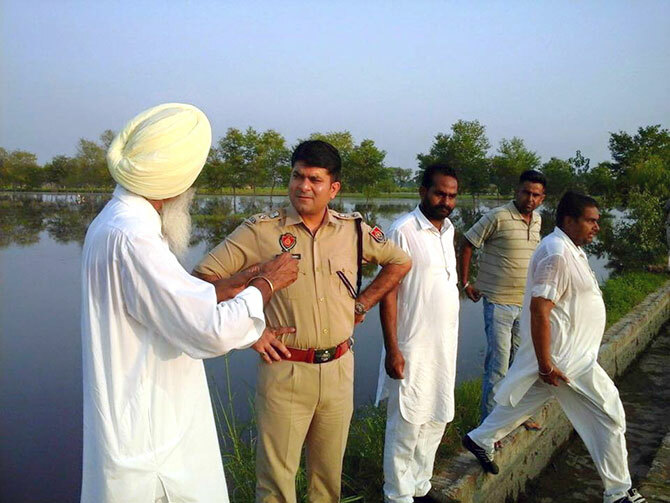 Last year, while serving in the border district of Fazilka, Sharma and his men arrested a senior Border Security Force constable with 4 kg of heroin and around 4 crore (Rs 40 million) rupees. "Punjab is not a consuming state, it is a transit state. Here, not more than 1 per cent consume drugs from across the border. 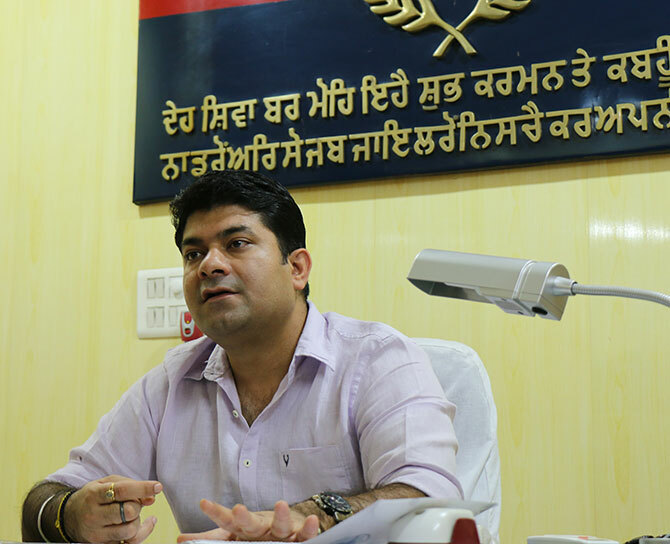 Punjab's drug problem has been blown out of proportion," says Sharma who has started an initiative, 'Ubharda Bathinda' or 'Rising Bathinda' to analyse the drug situation and increase awareness. 80 per cent of the heroin that comes in is transported out of the state in less than 24 hours. The remaining 20 per cent is shifted out in a week or so. The state does maximum recoveries and registers maximum cases, says Sharma, a 2008 batch Indian Police Service officer whose wife serves in the Indian Foreign Service. 95 per cent of the total chronic drug users in Punjab use poppy husk or bhuki, 5 per cent use synthetic drugs, explains Sharma. "In the olden days, opium or afeem was given to farm labourers as they set out for a hard day of manual work in the fields, it did not directly affect their health because they were strong men," the police officer adds. "The problem has been caused by the heroin that is crossing the border." Punjab, he says, does not produce poppy for use and bhuki shops in neighbouring Rajasthan have been banned. The previous director general of the Punjab police's drive to admit addicts to rehabilitation centres last year registered 330,000 users. Most of them did not need hospitalisation, says Sharma, as a majority used poppy husk which can be treated with two weeks of medication. While Chief Minister Parkash Singh Badal and his son Deputy Chief Minister Sukhbir Singh Badal -- who have been at the helm of the state for two terms and hail from Bathinda -- have underplayed the extent of the problem, Punjab has opened five rehabilitation centres. There are plans to have one centre in every district. An exclusive centre for women opened in Amritsar last week. 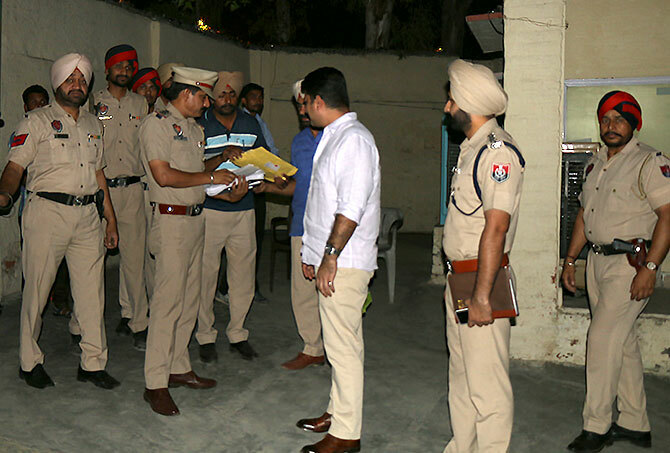 The government rehab centre is Bathinda is on the outskirts of the town, while the de-addiction centre is within the premises of the civil hospital. One of the five big districts of Punjab, Bathinda has several private de-addiction and rehab centres. "Once the patient had been de-toxified, he is sent here. This facility is basically for counseling and helping him go back into the mainstream," says Dr Mayank Jyot Singh, the chief medical officer. IMAGES: Dr Mayank Jyot Singh, the chief medical officer of the state government-run drug rehabilitation centre in Bathinda. The facility in Bathinda is well-equipped and opened recently. The fee was slashed from Rs 200 to Rs 50 per day subsequently. Thirty eight patients have sought treatment so far, though it had no patients at that time we visited, 7 patients were expected the next day. "The situation is grave no doubt," says Dr Singh. "Drug usage is rampant, so is alcohol. Many are consuming heroin." 5 grams of heroin costs approximately Rs 10,000. An All India Institute of Medical Sciences report in January deduced that opiates worth Rs 7,500 crore (Rs 75 billion) were consumed in Punjab. Heroin's share alone accounting for Rs 6,500 crore (Rs 65 billion). With a population of around 27.7 million pople, the AIIMS study said Punjab has more than 123,000 heroin-dependent people. SSP Swapan Sharma vehemently refutes the AIIMS report and questions the sample survey. The police officer feels there is too much propaganda against the state. "In reality there won't be more than 15 per cent youth on drugs," he says, dismissing the figure that 70 per cent of Punjab youth use drugs. "We haven't been able to differentiate between the occasional sniffers and chronic users and all have been clubbed as drug users," says Sharma. "People from good families in bigger cities in other states are also known to sniff once in a while," he adds, "but in Punjab you get badnaam (a bad name) because of this hype." There are more drug users in Delhi and Rajasthan than in Punjab, he says, adding, "Our focus has to be on the chronic users." If the drug situation is not as bad why then the need for a drug awareness initiative like 'Rising Bhatinda', I ask. Sharma says it was started because the issue of drugs came up in interactions with the public. "The real purpose of the initiative is to find the real situation through a real survey," the officer points out. The Ubharda Bhatinda or Rising Bathinda initiative will assess the ground situation and identify chronic drug users with the help of 5-member committees spread over 303 villages in the district. While the government rehab centre with its wards, counselling rooms, gymnasium and activity room looks deserted without any patients the day we visit, the medical officer says it needs at least six months at the facility for a patient to make a full recovery. Patients are eager to leave quickly because they come from far off areas and cannot be made to stay by force. "They don't like the discipline here and are prone to getting their fix again after leaving," says Indrajeet Singh, a staffer at the centre. On its walls are messages advocating the virtues of a life without drugs. Of the 38 patients who were treated at the facility, most were young men from economically weak backgrounds. The rich go to private de-addiction centres. An addict administering drugs intravenously, says Indrajeet Singh, does not live beyond two or three years. "Don't know what kick they get that they keep craving it," adds Dr Singh, "This needs a multi-pronged approach -- the government, police, family and society -- all have to work." 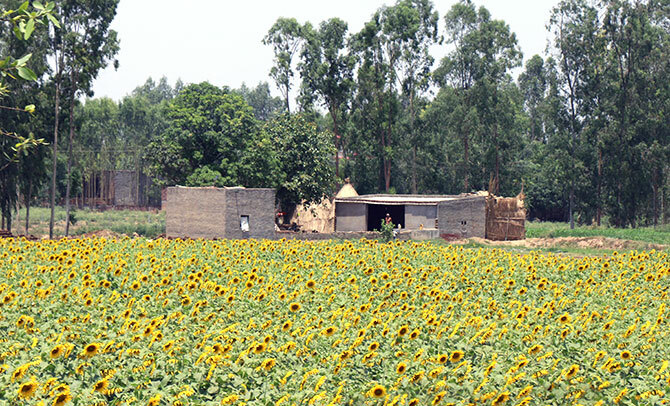 What you should also know about Bathinda: It is home to one of the largest cantonments in India. The road from Patiala to Bathinda was being constructed as we traveled and the worst stretch we encountered on our journey. We were told there was another route that was better. 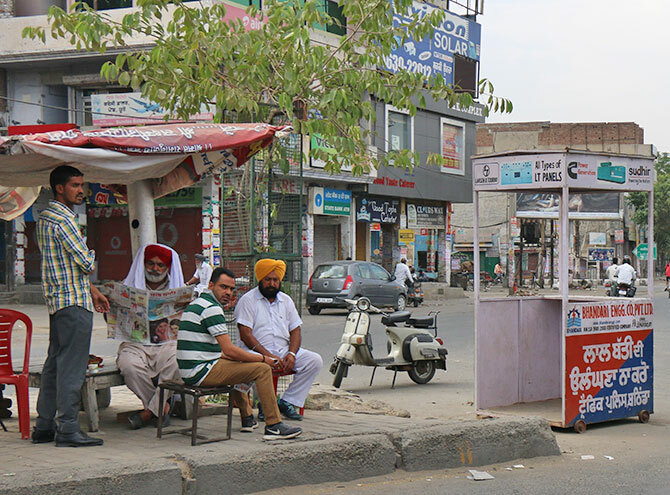 You can have local Punjabi breakfast near the railway station. Next: Chhattargarh-Bikaner: Where have the dhabas gone?